Image courtesy of Texas Ale Project. Next week, Texas Ale Project of Dallas will release the 2017 edition of its popular white Russian imperial stout, The Caucasian. First arriving on the scene in 2015, The Caucasian (9.0% ABV, 75 IBU) is brewed with vanilla beans and cold brewed coffee, prior to being aged on toasted American oak. The vanilla beans used in the beer are sourced from the Bourbon Island of Madagascar, while the coffee is a selection chosen in collaboration with a Dallas-based roasting company. 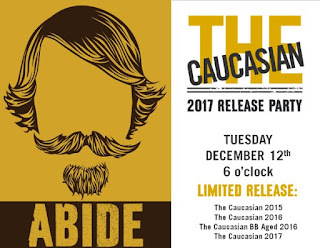 This year's vintage of The Caucasian will debut during an event at Texas Ale Project's facility in the Design District on Tuesday, December 12 from 6-10 p.m. The evening will also feature tappings of The Caucasian 2016, The Caucasian 2015 and The Caucasian Bourbon Barrel-Aged 2016, not to mention a special food pairing and glassware presentation. In addition, Texas Ale Project has obtained nine bourbon barrels from Knob Creek, one of Jim Beam's small-batch brands, for use in aging a portion of the 2017 release. As for when the finished beer will be available, The Caucasian is expected to age for around 10 months, so look for the barrel-aged version to appear in the fall of next year.